BOSTON–To celebrate the independent and entrepreneurial spirit of the craft beer industry, Samuel Adams has collaborated with five different breweries across the country to brew a limited release 12-pack for the first-time ever, aptly named The Brewing the American Dream Collaboration Pack. From bartenders to chefs, the collaborative spirit of “craft” is stronger than ever. No industry better exudes this spirit than the craft brewing community, where independent brewers put aside competition to collaborate creatively and challenge each other to push the envelope. Unlike any other beer collaborations before, this pack features brewers who are part of Samuel Adams Brewing the American Dream, the brewery’s signature philanthropic program. Nearly a decade ago, Sam Adams created Brewing the American Dream to provide loans and coaching to craft brewers and small business owners pursuing their passions and the American Dream of starting their own business. All profits from this collaboration pack will be donated to non-profit program partner and small business lender Accion to support loans to food and beverage entrepreneurs nationwide. The pack’s five brewers – Roc Brewing Co. (Rochester, NY), Bosque Brewing (Albuquerque, NM), ChuckAlek Independent Brewers (Ramona, CA), Woods Beer Co. (San Francisco, CA) and Brewery Rickoli (Wheat Ridge, CO) – have participated in the program and received a loan to kick start or grow their craft breweries. And most have participated in the Brewing and Business Experienceship, receiving individual coaching from the team at Sam Adams. The pack, which contains five unique collaboration beers and Sam Adams’ flagship Boston Lager, hits stores nationally in late July. ThreeNinety Bock is a slightly roasted Maibock with a sweet toffee and light caramel flavor, crafted from four hop varieties, combined with rye malt and oak smoked malt. Mosaic and Hallertau Mittelfrueh hops provide the balance that gives this dark golden bock a big, juicy character and slightly sweet and dry finish. ThreeNinety is a nod to the distance in miles between Boston and Rochester. “Over the past 6 years with the help of Brewing the American Dream we took our business from a home brew hobby to a fast-paced brewery with 4 full-time employees and 8 part-time employees,” said founder Chris Spinelli. Desert Kaleidoscope, pays homage to the Albuquerque balloon fiesta and features a mixture of flavors including citrus, tangerine, pine and honey malt to create a brew with a bold, hoppy aroma. With a 7.0% ABV, Desert Kaleidoscope is a deep amber, medium-bodied brew that leaves a clean touch of lingering bitterness on the palate. Driven by co-founders Grant Fraley and Marta Jankowska’s mission of creating “Old School Beers for New School Palates,” Time Hop Porter utilizes Zeus, Chinook, Cascade and Goldings hops and is 5.3% ABV. The hop character is balanced by three malt varieties: Sam Adams pale two-row blend, Crisp Brown, and Black malt. This porter has strong notes of citrus and pine that are balanced by a smooth, roasted malt character. Boston Tea Party Saison is a bi-coastal twist on the classic Belgian style, combining Woods’s yerba mate-infused saison with Sam Adams’ wild yeast blend, Kosmic Mother Funk. Mate’s earthy spice plays on the rippling, fruity haze of KMF’s funky bacteria, and gives a signature snap to the amber saison’s traditional dry finish. Oats McGoats is an American stout brewed based on founder and brewer Rick Abitbol’s commitment to brewing full-flavored, gluten-reduced beers (if they didn’t say it, you wouldn’t know). At 6.5% ABV, the full-bodied, moderately carbonated beer is accented by earthy, spicy flavors and a hint of roasted coffee notes. Samuel Adams Boston Lager is the original collaboration beer between Jim Koch and his father, using his great-great grandfather’s recipe – helping lead the American craft beer revolution and reviving a passion for full-flavored beer. Only the finest hand-selected ingredients are used to create this perfectly balanced and complex original brew, including two-row malted barley and Bavarian Noble hops. Boston Lager is full-flavored with a balance of malty sweetness contrasted by hop spiciness and a smooth finish. 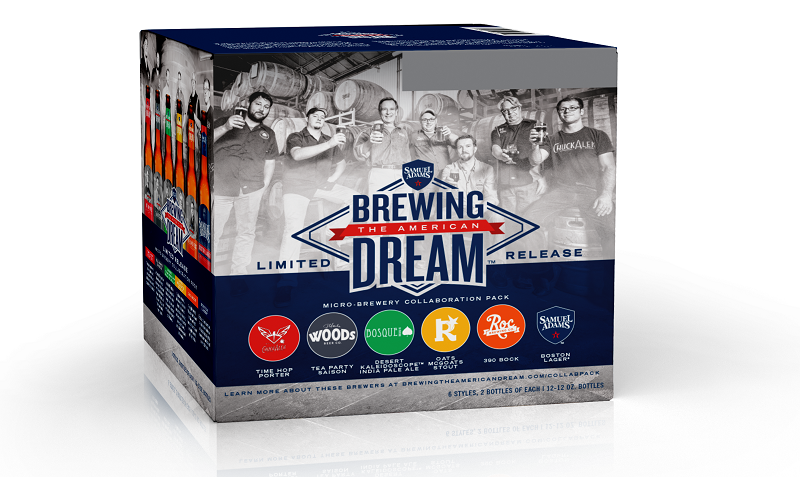 AVAILABILITY: The Brewing the American Dream collaboration 12-pack will be available nationwide with limited availability for a SRP of $16.99-19.99 starting in late-July. For more information, visit www.brewingtheamericandream.com/collabpack. Jim Koch first brewed Samuel Adams in his kitchen in 1984 and in his pursuit of a better beer, he ignited the craft beer movement, inspiring a whole new beer category that’s produced millions of jobs in communities from coast-to-coast. Jim launched the Brewing the American Dream philanthropic program in 2008 to give back to the community in which he started and help small business owners and fellow craft brewers pursue their passion and achieve their American Dream. Since the launch of the program, Sam Adams and Accion have worked together to counsel more than 8,000 small business owners and provide more than 1,300 loans totaling nearly $18 million to 1,000 small businesses that have gone on to create or retain over 5,300 jobs across America. The program has provided nearly $1 million in loans to 40 small craft brewers. For more information, please visit www.brewingtheamericandream.com. Today, The Boston Beer Company brews more than 60 styles of beer. It relentlessly pursues the development of new styles and the perfection of classic beers by searching the world for the finest ingredients. Using the traditional four vessel brewing process, the Company often takes extra steps like dry-hopping, barrel-aging and a secondary fermentation known as krausening. The Company has also pioneered another revolution, the “extreme beer” movement, where it seeks to challenge drinker’s perceptions of what beer can be. The Boston Beer Company has been committed to elevating the image of American craft beer by entering festivals and competitions around the globe, and is one of world’s most awarded breweries at international beer competitions. As an independent company, brewing quality beer remains its primary focus. Although Samuel Adams beer is America’s leading craft beer, it accounts for only one percent of the U.S. beer market. The Boston Beer Company will continue its independently-minded quest to brew great beer and to advocate for the growth of craft beer across America. About Accion in the U.S.
Accion creates economic opportunity by partnering with small business owners to provide access to capital and business support to grow healthy enterprises and contribute to thriving local economies. Accion is a nationwide network of mission-based lenders combining deep local knowledge with cutting-edge lending solutions and unmatched personalized advising. Since 1991, Accion has provided more than 60,000 loans totaling more than $500 million to businesses that collectively have generated and sustained more than 22,000 jobs across the U.S. For more information on Accion small business loans in the United States, please visit https://us.accion.org. I can’t say Samuel Adams is my absolute favorite beer, but I really do enjoy their sampler packs. They release a lot of interesting beers that are usually good. I tend to stay away from the fruity ones, but this one looks like it will be a winner. I’ll definitely need to keep an eye out for it!